Mention Madrid to sports fans and you'll almost certainly be met with a reply of 'Real Madrid'. Recently named the most successful football club in the twentieth century by FIFA, famous players have included Ronaldo and David Beckham. Real Madrid play at the Santiago Bernabeu stadium where tours can be taken between ten and seven Monday to Saturday and between ten thirty and six thirty on Sundays. Tours are conducted in a limited form prior to matches and begin five hours before kick off. The stadium tour includes a panoramic view of the stadium, a visit to the trophy room and a walk around the pitch. To get a full sense of pre-match atmosphere fans can also visit the player's tunnel, benches and coaching area . Visits to the dressing rooms are allowed however, due to the wishes of the Real Madrid players, the tour visits only the visitor's dressing room. If you'd like to extend your sporting tour of the city beyond Real Madrid be sure to visit Atletico Madrid's Vincente Calderon. Located in central Madrid by the banks of the Manzanares, this stadium regularly holds international football matches and also plays host to concerts by superstars such as Madonna and U2. Spain is a European basketball heavyweight, with Real Madrid's Balconcesto team having won the European championship more times than any other club. The national team is also, as of 2009, reigning World and European champions. 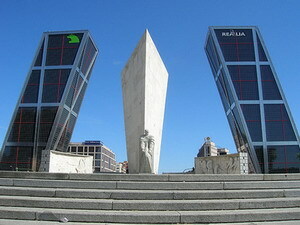 October brings the Mutua Madrilena Madrid Open tennis tournament which takes place in the Madrid Arena. This event is classed as an ATP World Tour Masters 1000 and features the top forty eight players of the year. Tickets are put on sale in March, be prepared to pay vastly inflated prices if you choose to buy from a tout at the last minute. Many travel companies also put on packages including accommodation and additional tours. For some real adrenalin thrills head to the mountains of Sierra de Guadarrama for some snow based action. Veldesqui is a large resort with twenty seven pistes, however it can be expensive and may not have the amenities skiers are accustomed to in more established resorts. Puerto de Navacerrada has a salom stadium and ski jump and La Pinilla also offers skiing and snowboarding just sixty miles from the capital. Before your trip be sure to browse through the Best Hotels in Madrid and make sure you don't miss the famous Madrid Nightlife.